Overview: Want your son to someday become a responsible man someday? Have him do hard things now. Our sons are men in training! Here are 11 suggestions for raising a son who will become a real man. 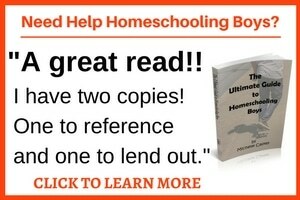 Includes a Raising Responsible Sons Worksheet. No matter where you look today, the same battle cry seems to be sounding forth: Where have all the good men gone? We can all readily see the difference between a responsible man and a perpetual adolescent. There are too many males in our society who don’t want to do the hard things that we are relying on them to do. Too many young men would rather play video games than get a job. Too many of them would rather look out for their own interests rather than taking on the responsibilities of caring for a wife and children. Fortunately, as we raise our boys, we don’t have to stand idly by and watch them become a hopeless statistic. 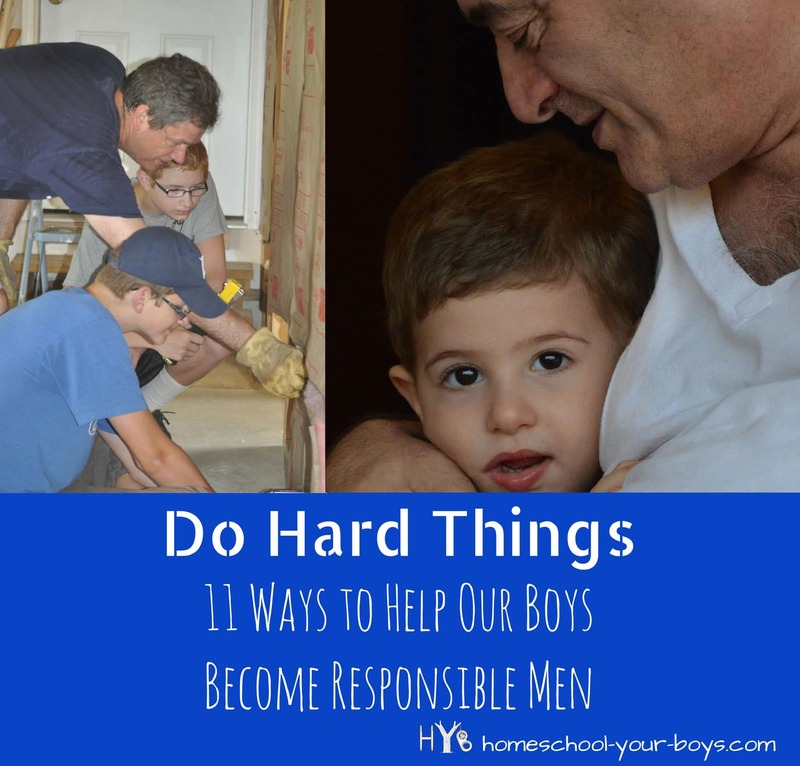 There are lots of things we can do to help our boys become responsible young men! Most boys like to compete. 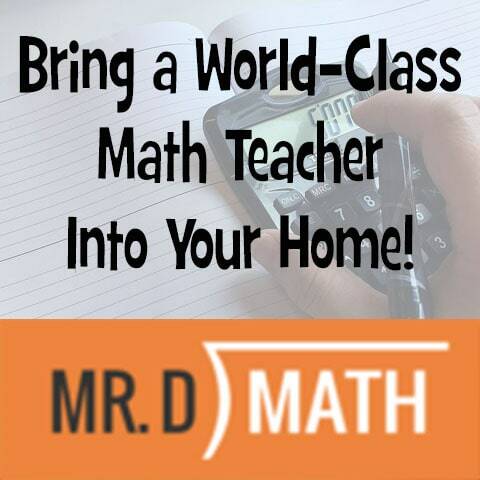 This can be used to your advantage when you’re trying to get him to do his schoolwork. Unfortunately, most children nowadays are being taught that everyone deserves a trophy which doesn’t teach them the value of trying to do their best. Give your son opportunities to compete against others. Team sports, field days, contests, science fairs any sort of competition in an area of his choice. Even competition with siblings can be positive for boys. Give your son a chance to compete and watch him push himself to excel! Put your son in charge of certain tasks around the house. 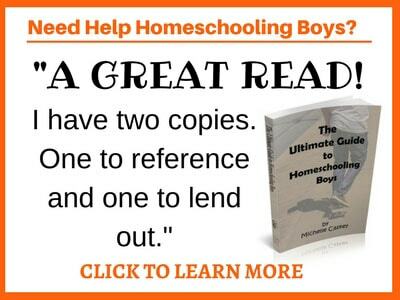 Boys benefit from having to complete chores around the house. Encourage them to at least give things a try. If our boys never try anything new, they won’t find out what they’re really passionate about. My oldest son has decided he’s interested in film directing and editing so I found a film camp for him to participate in. I also talked with a family member, who does videography on the side, and have asked him if he can take my son under his wing and show him the ropes from time to time. 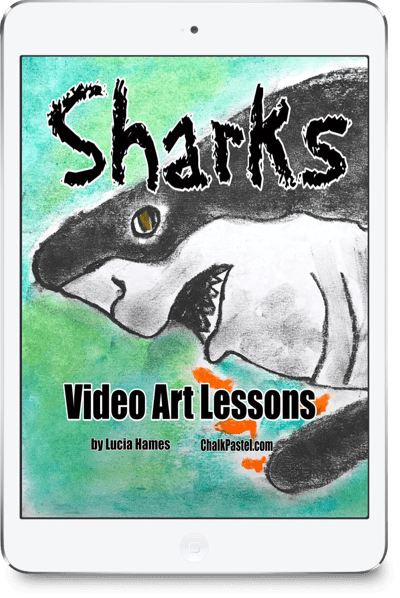 My youngest son decided he would like to be an actor – but not just any type of actor. He wanted to act in big blockbuster Hollywood films, such as his favorite “Lord of the Rings.” I explained to my son that if he wanted to explore acting, he was going to have to learn how to be a stage actor first. 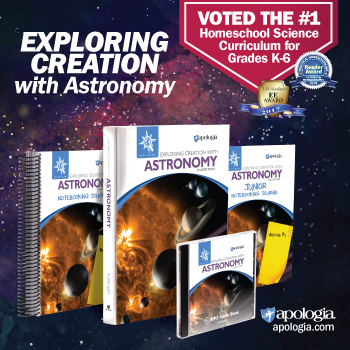 We have a Christian group in our area called Homeschool Performing Arts which puts on top-notch performances every year. I asked my son if he would like to give their summer camp a try. He was nervous at first. He said he didn’t have any interest in acting on stage. I told him that if he was serious about becoming a film actor, he needed to take this route. My son was reluctant but he agreed to give it a try. He attended their camp a few weeks ago and he genuinely surprised all of us. Not only did he end up loving the acting, he also enjoyed the choreography as well. And he’s excited to audition for their performance this coming year. We’re all thrilled that he was willing to try this new experience in order to explore his newfound passion for acting. Being a man is hard work! Us women depend on our husbands and fathers to do lots of dirty, sweaty stuff for us. Getting your son used to this type of work will benefit himself and his family down the road. Our family had the opportunity to buy a low-cost swimming pool a few summers ago. We told our boys that before we could purchase the pool, they would need to help clear and level a spot in our backyard for it. With the motivation of a swimming pool, the boys dug into the job with gusto. My husband and I thought it might take a week to remove the sod and level the area for the pool. 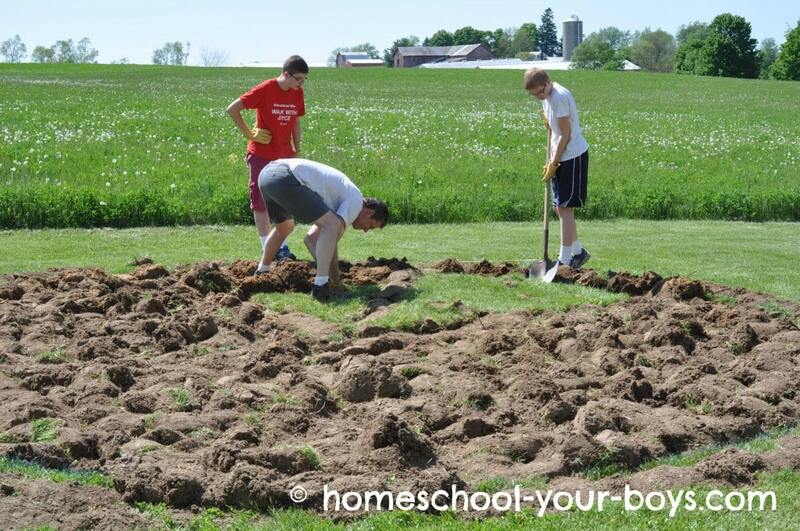 With the enthusiastic help of our sons, it only took about a day and a half to get the ground prepared. We want our boys to relish hard work versus avoiding it! I’ve found that when you dread something in life you should do it first and get it over with. When you find something that your son fears, try pushing him to face his fear. 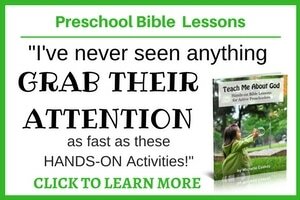 You might be amazed at what your son can accomplish! A few years ago, we found out about an opportunity called The Institute for Cultural Communicators (ICC). They teach kids how to communicate with others both in small groups as well as in larger venues. As soon as my boys heard about this “public speaking class,” they were very upset. They didn’t want to go and they put their foot down. My husband and I feel that it’s important for our boys to be good communicators so we pushed them. We told them they had to give this class a try. It was a huge struggle for our family – neither boy wanted to go. I had to bribe them with lunch from McDonald’s and skipping math on ICC days before I could even get them in the car. After having participated for a few months, we saw such a positive change in the boys. They were no longer dreading giving their speeches. They were looking forward to going to ICC so they could see their new friends. Their attitudes completely turned around. 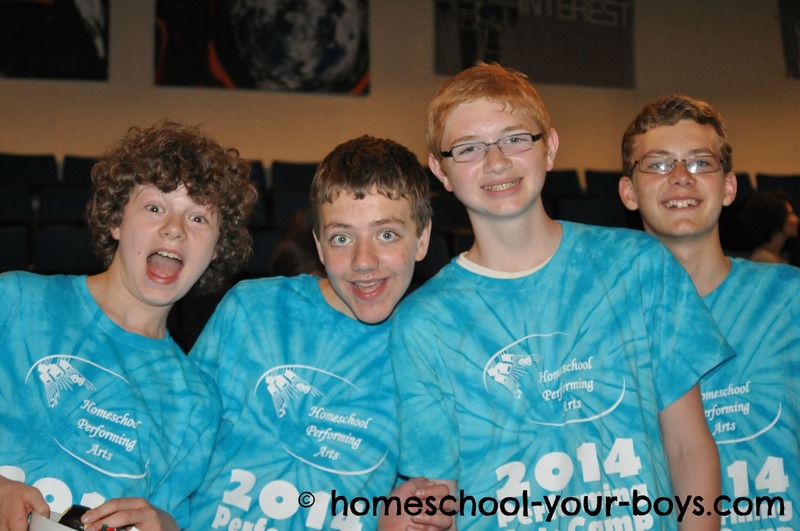 Facing their fear of public speaking was such a growing experience for them. And this experience also tied right into my youngest son’s desire to try acting on stage. I’m go glad we pushed them to face their fear. Who knows where it might lead in the future?!? Whenever possible, it’s great to allow your son to come to your rescue. When we have a bug in our house, I always call out for my sons to come kill it for me. If they aren’t home, I’m fine with killing bugs. When they are home, however, it’s great practice for them to come to my aid. We want our sons to look for ways to be gentlemen with the ladies in their lives. I also have my boys bring in the grocery bags from the car, reach up high to get stuff down for me, lift heavy objects and anything else I can think of for them to help me. If they have to help you solve mental problems, that’s also great for their ego. You want them to feel good about and want to take advantage of any opportunity where they can come to someone’s aid! This is the most important thing you can do for your son and his future family. Helping your son to humble his heart before God is crucial to his future development as a man. We want our sons to become gentlemen. It’s important that we train them to open doors for women and to be polite when they’re around them. Give your son a chivalrous code of conduct so that he knows what type of behavior you expect from him. If you would like to explore this concept further, Raising a Modern Day Knight by Robert Lewis is a great resource! When boys are given a chance to attend camp, go on overnights to trusted friends’ houses, and go on youth group events with the church, they have the opportunity to put into practice some of the skills they’ve been learning at home. They have to make decisions, budget spending money, make friends, stand up for what they believe is right, etc. 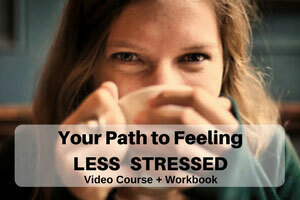 without having the luxury of turning to you for guidance. This is a great way for them to internalize the values you’ve been teaching them. It also gives them the opportunity to be brave. My boys look forward to attending a Christian Camp every summer. When we first started sending them they were understandably nervous. We made sure they had some friends going with them. We tried to prepare them for whatever situations they might face. And we were nervous for them as well! Now that they’ve been going on these ventures for several years, we don’t worry about them (as much) anymore. They know how to pack their bags. They are more likely to have their spending money last through the week. Our youngest son also said that he’s alright with going to camp on his own next year because he’s confident that he’ll make friends in his cabin while he’s there. Our boys learn a bunch when they have a chance to spread their wings and venture out without us. Your son needs heroic examples to follow after. When your husband does something chivalrous, point it out to your son. Look for examples in media for people who have done the hard thing and have risked their lives to save another. Watch movies with heroic people and discuss them with your son. Help him to have high ideals to follow. Sometimes we coddle our sons because we’re afraid they will hurt themselves. 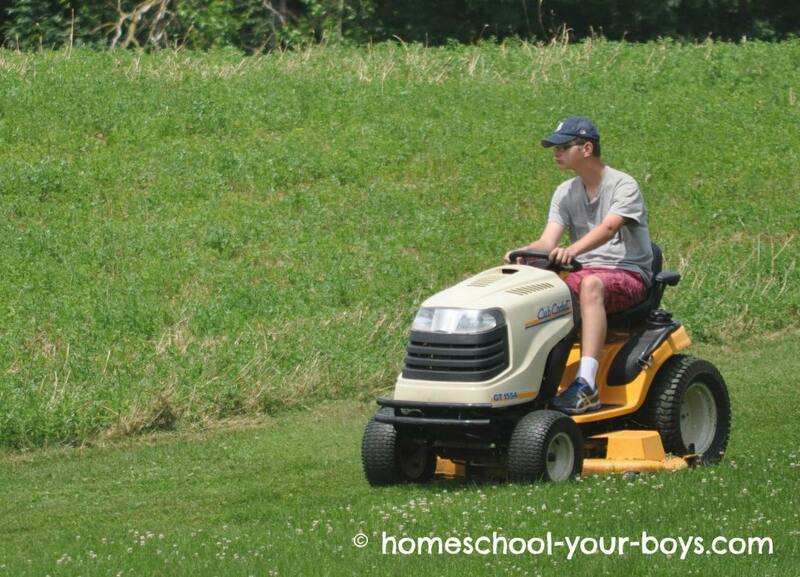 Let your son use the rototiller, mow the lawn with the riding lawnmower, use the chop saw, wield the chainsaw or ax. These tools are dangerous so caution should be taken and they should be properly trained and supervised until they have proven they can handle it on their own. When your husband wants to show your son how to use these tools, be grateful. Don’t stand in his way. Our boys will gain so much self-confidence when they are treated like men and allowed to use these dangerous tools. As parents, we have many opportunities to raise our sons in a way which will shape them into strong, courageous, chivalrous men. Encourage your sons in the above areas and you will be amazed at how quickly they will mature and gain responsibility. QUESTION: Do you encourage your son to do hard things? What have you done that has helped equip your son to become a responsible man? Please leave a comment below. I’m blessed to have three stepsons who are all in their 20s now. I remember doing most of the things on this list throughout their lives and it doesn’t ever really stop I don’t think. One incident that sticks out for some reason is one day two of them were tossing a football and continued on their way to the back porch. The ball got away from them and broke a basement window. I am not necessarily the coolest headed person, so I imagine they figured I’d be at least a little upset. They did own up to it though and told me (their Dad was with them too). Somehow grace intervened and I was not upset at all, but simply told them that it appeared they had a fix it project to do. Not only did they have to take responsibility for the problem, they had to “man up” and take care of the problem that had been caused. They handled it well and I think the situation turned out to be a good lesson. Thank you for these great articles. This issue is one I struggle with at times, but based on compliments I receive about my 11 yr. old son, I must be doing ok. I am a single mom. Though his dad is around, he chooses to be minimally involved and he is NOT an example, unfortunately, of a strong, Christian man. We don’t really have any male role models around for him, which is why I made the decision this year to move to another state to be near my younger brother & his wife. My brother is a strong Christian man whose influence during these pre-teen and coming teen years will be very important, I think. Beautifully written. 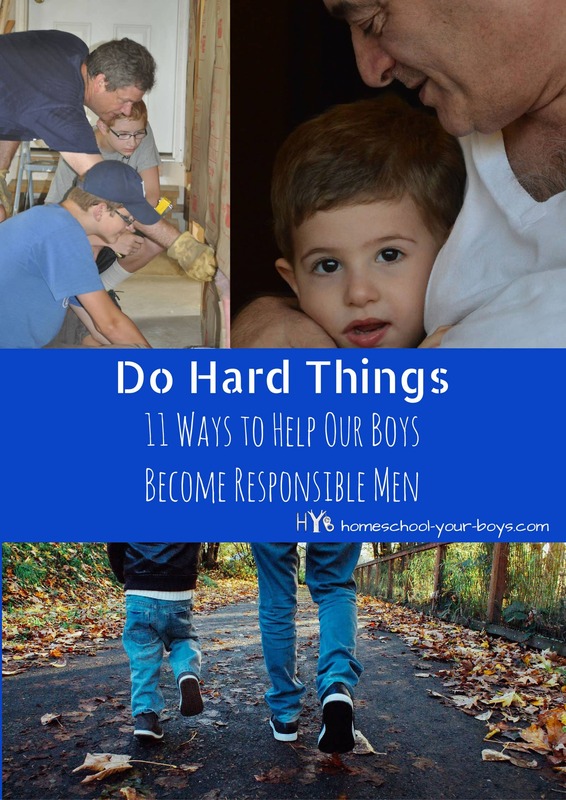 Yes, boys need responsibility, work, compassion, and more to become men. I have worked hard to teach my boys to be gentlemen. Our world needs men of character. Thank you for raising your boys to be such men! This is a great list! I saw the Raising a Modern Day Knight book at the store last week and thought it would be a good resource for later (my son is 4). Thankfully, we live on a farm so there is no shortage of work here. 🙂 Both of my kids pitch in and like to help, for now at least! Thank you for linking up with the SHINE Blog Hop this past week! Thanks, Sarah! Yes, that book is a great resource. I would try to read it within the next couple of years so that you’re ready once your son is just a bit older. Growing up on a farm is awesome! Yeah, I’m sure there are ample opportunities for your kids to pitch in. 🙂 Hope you have a great day. What a terrific article! Thank you for sharing this wonderful insight. I do not have children of my own, but have nephews and their parents are doing things similar to this… warms my heart as they are growing and evolving into fabulous, caring, thoughtful and courageous young men. Thanks again! Thank you for sharing this excellent list – the world needs good men! I really enjoyed the ‘letting them use dangerous tools’…. I enjoyed your writing style and appreciate your heart behind this piece. However I would gently suggest that all of these suggestions and these skills are good for raising responsible women as well. Both genders are sadly lacking in strength and character in our modern times and I think we need to be asking more of our kids, no matter the gender.